Research shows that Coconut Fibre (Coir) is the new Aloe Vera. It is known to have a lot of properties that people were hoping Aloe Vera also has, but were disappointed later. There is even a possibility that coir has all the benefits that 'oil-pulling' was supposed to have, and there is increasing evidence that coir is 'the one', that will save humanity from the Matrix. 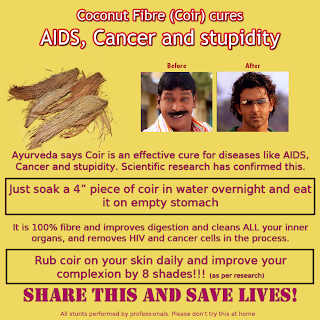 An expert who wished to remain anonymous said, "If you are one of those who fall for miracle cures on Facebook, like 'Sitaphal cures syphilis' and 'Banana cures bad breath', you probably need to eat a lot of soaked coconut fiber on empty stomach daily to cure your intelligence-deficiency. Add a bit of salt if you want, but never sugar! Sugar makes coir taste sweet." Check out the picture and see how people can transform themselves using coir.